The following is a selected list of the many books on Baptist history, doctrine, polity, ministry, and organization. Most of the items relate to Baptists in the United States, but some of the resources contain information about Baptists in other parts of the world. This list is not intended as an endorsement in any way of these resources. Allen, Clifton and Lynn E. May, Jr. eds. The Encyclopedia of Southern Baptists, 4 vols. Nashville: Broadman Press, 1958-82. Articles on an extensive number of topics ranging from persons, individual churches, institutions, and doctrines. Leonard, Bill J. Dictionary of Baptists in America. Downers Grove: InterVarsity Press, 1994. Brief discussions of an extensive list of Baptist organizations, persons, and doctrines. Mead, Frank S. and Samuel S. Hill. Handbook of Denominations in the United States. Nashville: Abingdon Press, annual editions. Contains a brief description of the major Baptist groups in the United States including information on organization, key leaders, and addresses. Wardin, Albert W., ed. Baptists Around the World. Nashville: Broadman & Holman, Publishers, 1995. Brief descriptions, histories, and current status of Baptists in various parts of the world. Baker, Robert A. A Baptist Sourcebook, With Particular Reference to Southern Baptists. Nashville: Broadman Press, 1966. Excellent material to help understand the development of Southern Baptists. Brackney, William H. Baptists Life and Thought, 1600-1980: A Source Book. Rev. Valley Forge: Judson Press, 1998. Uses primary documents from the seventeenth through the twentieth centuries to provide insight into important Baptist beliefs. Early, Jr., Joseph. Readings in Baptist History. Nashville: Broadman & Homan Publishers, 2008. Contains a wealth of diverse primary documents from 1600 to 2000. Freeman, Curtis W., James Wm. McClendon, Jr., and C. Rosalee Velloso da Silva. Baptist Roots: A reader in the Theology of a Christian People. Valley Forge: Judson Press, 1999. Contains selected and excerpted historical documents from numerous outstanding Baptists through history related to the development of the Baptist movement. George, Timothy and Denise, eds. 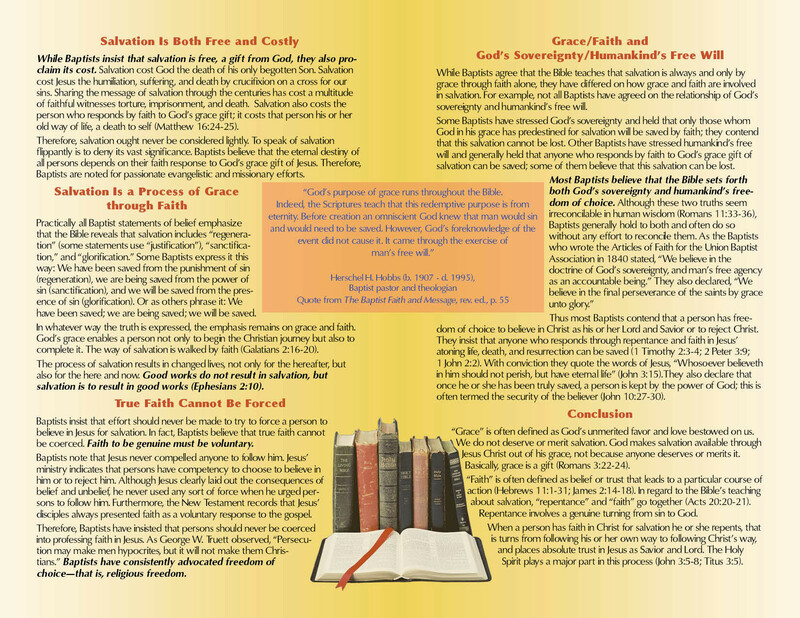 Baptist Confessions, Covenants, and Catechisms. Nashville: Broadman & Holman Publishers, 1996. Contains four centuries of primary resources of Baptist beliefs along with a brief historical account by the editors. George, Timothy and Denise, eds. Treasures from the Baptist Heritage. Nashville: Broadman & Holman Publishers, 1996. A collection of ten articles and/or sermons from Baptist leaders from William Carey to George W. Truett. Gillette, A.D., ed. Minutes of the Philadelphia Baptist Association from 1707-1807. Atlas, MI: Baptist Book Trust, 1851. Contains the minutes of the first one hundred years of the oldest existing Baptist association in America. Groves, Richard, ed. A Short Declaration of the Mystery of Iniquity. Macon, Georgia: Mercer University Press, 1998. A brief biography of Thomas Helwys and the text of his book in modern English form. Harper, Keith and C. Martin Jacumin, eds. Esteemed Reproach: The Lives of Reverend James Ireland and Reverend Joseph Craig . Macon, Georgia: Mercer University Press, 2005. A collection of the writings of two early Virginia Baptists with bibliographic information by the editors. Lumpkin, William. Baptist Confessions of Faith. Valley Forge: Judson Press, 1959. Contains various Baptist confessions over hundreds of years. McBeth, H. Leon. A Sourcebook for Baptist Heritage. Nashville: Broadman Press, 1990. A very large collection of primary documents from the early days of Baptists to the last part of the twentieth century, worldwide in scope but majors on Baptists in Great Britain and America. McGlothlin, W. J. Baptist Confessions of Faith. Valley Forge: Judson Press, 1911. Contains an extensive collection of various Baptist confessions. Morrell, Z. N. Flowers and Fruits In the Wilderness, 3rd ed., rev. St. Louis: Commercial Printing Company, 1872. A vivid first-hand account of early Baptist life in Texas by one of the foremost Baptist leaders of the time. Alter, James A. and Dolton W. Sidney Robertson II. Why Baptists? Ohio: Ancient Baptist Press, 2008. The authors state that the book focuses on “the significance of Baptist principles in an ecumenical age. “Written by two pastors from a conservative/fundamentalist point of view. Beck, Rosalee, Bill Pinson, James Semple, and Ebbie Smith. Beliefs Important to Baptists. Dallas: BAPTISTWAY PRESS, 2001; 2nd ed., 2011. 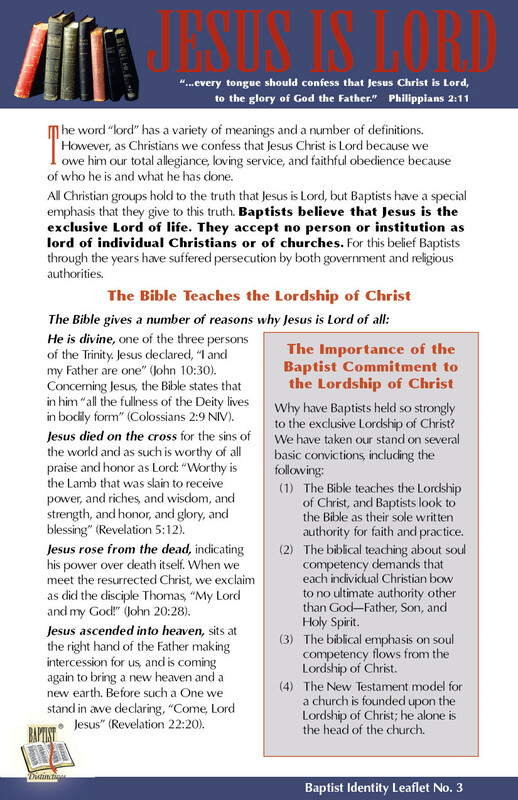 A Bible study with a study devoted to each of several basic Baptist distinctives. The material in this book is also available in four booklets designed for Bible study with both a student and teacher version available. They are available from BAPTISTWAY Press. Carroll, B.H. Baptists and Their Doctrines. Nashville: Broadman & Holman Publishers, 1995. This is one of the volumes in the Library of Baptist Classics published by Broadman and Holman and provides a summary of doctrinal beliefs by an influential leader in the Southern Baptist Convention. Colton, C.E. A 21st Century New Testament Church: Its Polity and Present Day Problems. Dallas: Self-published, 1999. An analysis of contemporary problems and challenges in Baptist church life by a longtime pastor. Deweese, Charles W., ed. 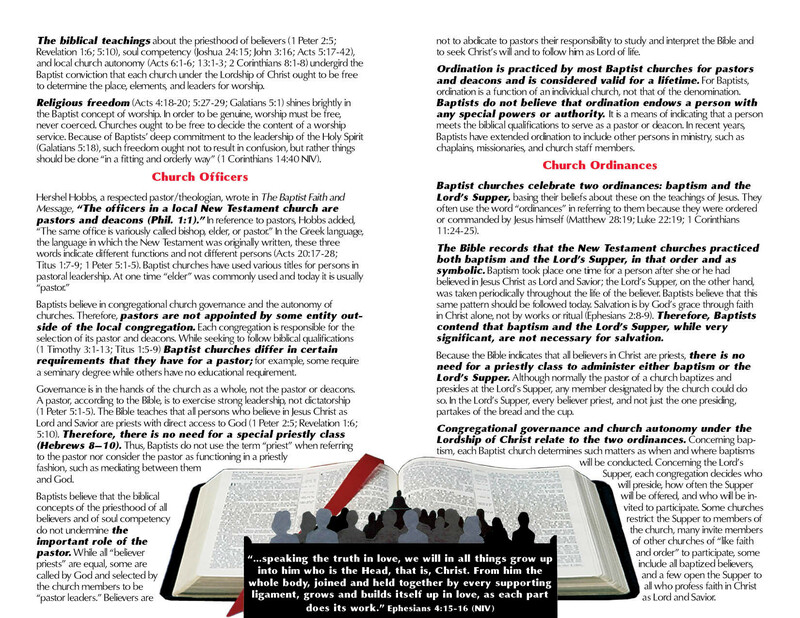 Defining Baptist Convictions: Guidelines for the Twenty-First Century. Franklin, TN: Providence House Publishers, 1996. A collection of articles by Baptist leaders, each article dealing with a particular Baptist doctrine, polity, practice, or issue. Garrett,Jr., James Leo. Baptist Church Discipline, rev. ed. Paris, Arkansas: The Baptist Standard Bearer, n.d.
First published in 1962 by Broadman Press and later revised by the author, the small book discusses some of the history and practices of Baptist church discipline with a focus on the 1773 Summary of Church Discipline by the Charleston Baptist Association. Garrett, Jr., James Leo. Baptist Theology: A Four-Century Study.. Macon, Georgia: Mercer University Press, 2009. A 743-page scholarly volume in the Baptist Series. George, Timothy and David S. Dockery. Theologians of the Baptist Tradition. Nashville: Broadman & Holman Publishers, 2001. Essays by various current Baptists on Baptist theologians from John Gill to Millard Erickson. George, Timothy and Denise, eds. J. M. Frost: Baptist Why and Why Not. Nashville: Broadman & Holman Publishers, 1996. A part of the Baptist Classics series, the editors have included chapters not only by J. M. Frost, but also by other leading Baptists of the late 1800s and early 1900s. The chapters deal with basic Baptist beliefs and also with issues related to Sunday School and Baptist state and national conventions. Greer, Jr., E. Eugene. “Concepts Vital to Our Baptist Heritage.” Dallas: BAPTISTWAY PRESS, 2000. A brief pamphlet in Spanish and English based on the 1963 Baptist Faith and Message with scripture references. Hammett, John S. Biblical Foundations for Baptist Churches: A Contemporary Ecclesiology. Grand Rapids, Michigan: Kregel Publications, 2008. Majors on Baptist distinctives in local churches. Contains helpful discussion of denominational differences in church governance. Hobbs, Herschel H. The Baptist Faith and Message. Rev. ed. Nashville: Convention Press, 1971. A discussion of the 1963 Baptist Faith and Message by a noted Baptist pastor/theologian. Hobbs, Herschel H. What Baptists Believe. Nashville: Broadman Press, 1964. A concise discussion of Baptist beliefs by a pastor/theologian. Jeter, Jeremiah B. and others. Baptist Principles Reset. Richmond, Virginia: The Religious Herald Company, 1902. Contains a series of articles by Jeter on Baptist doctrines followed by articles on various subjects by outstanding Baptists in America in the nineteenth century. Larkin, Clarence. Why I Am a Baptist. Philadelphia: The American Baptist Publication Society, 1887. Reprinted by CrossReach Publications in 2017. The author was a layman in another denomination but his study of Baptist doctrine led him to become a Baptist and eventually an American Baptist pastor. The book explains why he made this change. He became well known for his views on dispensationalism. Maring, Norman H. and Winthrop S. Hudson. A Baptist Manual of Polity and Practice. Rev. ed. Valley Forge: Judson Press, 1991. New Testament and historical sources to explore the Baptist understanding of church. Mosley, Ernest E. Basics for Baptists. Nashville: LifeWay Press, 1996. 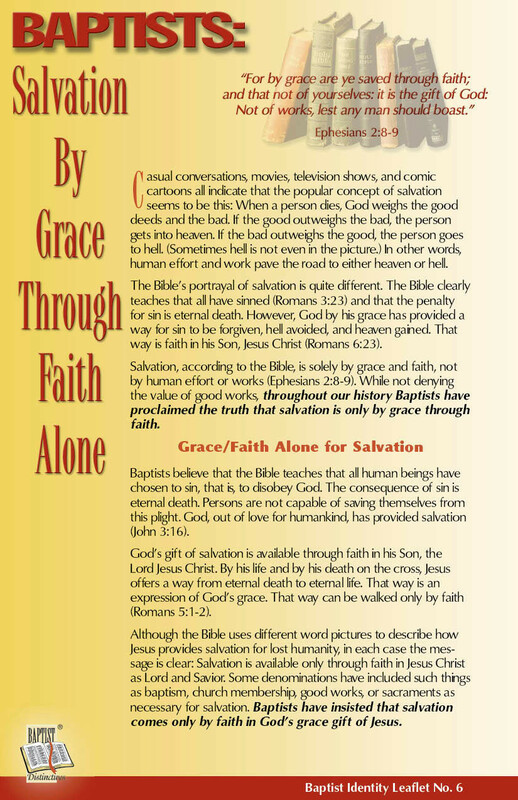 A booklet setting forth basic Baptist beliefs and practices; a source for classes of new church members. Mullins, E. Y. Baptist Beliefs. Valley Forge: Judson Press, 1925. A concise discussion of major Baptist beliefs by one of Baptists most influential scholars. Nettles, Tom J. and Russell D. Moore, eds. Why I am a Baptist. Nashville: B & H Publishing Group, 2005. A collection of relatively brief chapters by self-termed conservative Baptists, including pastors, professors, denominational executives, and theologians from the United States and other countries. The editors indicate that it is a response to the book by the same title from a so-called moderate Baptist point of view. Newton, Louie Devotie. Why I am a Baptist. New York: Thomas Nelson and Sons, 1957. Combines history, doctrine, and personal testimony including brief statements by fifty leading Baptist pastors and lay persons on why they are Baptists. Norman, R. Stanton. The Baptist Way. Nashville: Broadman & Homan Publishers, 2005. Majors on the doctrines and polities that make Baptists a distinct denomination with a focus on church. Norman, R. Stanton. More Than Just a Name: Preserving Our Baptist Identity. Nashville: Broadman & Holman Publishers, 2001. A discussion of Baptist distinctives with an extensive bibliography in a relatively brief format of less than two hundred pages. Pinson, Jr., William M. Issues that Test Baptist Polity. Brentwood, TN: Baptist History and Heritage Society, 2003. Brief articles on current tests of four major Baptist polities with historical and biblical information. Santiago, J. Manny. 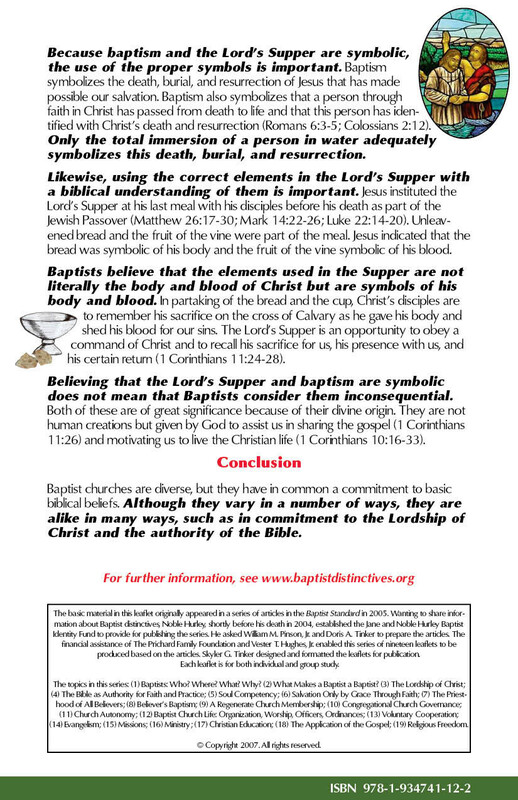 being baptist: lessons for new members. Valley Forge, Pennsylvania: Judson Press, 2009. An introduction to basic Baptist beliefs in both English and Spanish. Shurden, Walter. The Baptist Identity: Four Fragile Freedoms. Macon, Georgia: Smyth & Helwys, 1993. Explores biblical, historical, and contemporary aspects of Bible, soul, religious, and church freedom. Shurden, Walter. Baptist Freedom: Celebrating our Baptist Heritage. Macon, Georgia: Next Sunday Resources, 2011. A five session adult Bible study with each study composed of four parts: Reflecting, Studying, Understanding, What About Me? C. Douglas Weaver and Fisher Humphreys participated in the preparation of the Bible studies. Spooner, Bernard M., ed. Handbook for Baptists. 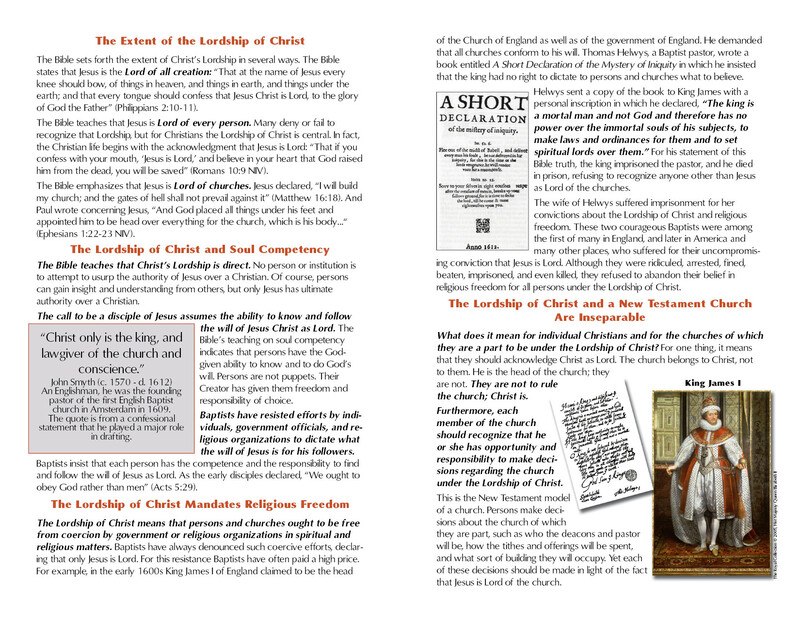 Coppell, Texas: Christian Leadership Publishing, 2013. Staton, Jr., Cecil P., ed. Why I Am a Baptist: Reflections on Being Baptist in the 21st Century. Macon, Georgia: Smyth & Helwys, 1999. Twenty-Six Baptist leaders, female and male, Black and White, from a variety of positions and places contributed to this volume, edited by the President and Publisher of Smyth & Helwys Publishing who also served as Associate Provost for Academic Publications and Associate Professor at Mercer University. Sullivan, James L. Baptist Polity as I See It. Nashville: Broadman & Holman Publishers, 1998. A long-time Baptist pastor and denominational leader sets forth his views on Baptist polity. Tuck, William Powell. Our Baptist Tradition. Macon, Georgia: Smyth & Helwys Publishing, Inc., 2005. Majors on four “traditions” of Baptists: authority of scripture, autonomy of the local church, priesthood of believers, religious liberty. Contains a selected bibliography and a leader’s guide for study. Wayland, Francis. 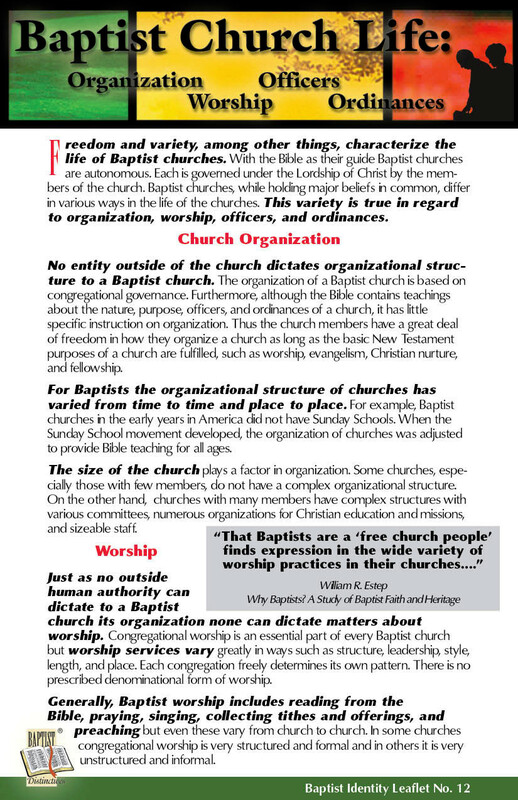 Notes on the Principles and Practices of Baptist Churches. Watertown, Wisconsin: Baptist Heritage Press, 1988. A reprint of a book originally published in 1857 by one of the leading Baptists of his day. Brackney, William H. A Genetic History of Baptist Thought. Macon, Georgia: Mercer University Press, 2004. A lengthy volume tracing the historical development of basic Baptist beliefs and practices. Contains excellent bibliographical resource. Durso, Keith E. No Armor for the Back. Macon, Georgia: Mercer University Press, 2007. An account of numerous Baptists who suffered persecution along with examples of their writings, often while in prison. Durso, Pamela R. and Keith E. The Story of Baptists in the United States. Brentwood, Tennessee: Baptist History and Heritage Society, 2006. A thoroughly documented and illustrated history of Baptists of various kinds in the United States. Fitts, Leroy. A History of Black Baptists. Nashville: Broadman Press, 1985. By a Black Baptist pastor and editor, the book sets forth the development of Black Baptists in America with a focus on missions, education, ministry, and social reform. Gourley, Bruce T. A Capsule History of Baptists. Atlanta, Georgia: Baptist History and Heritage Society, 2010. As the book’s title indicates, this is a capsule history; it is written from the perspective of a so-called moderate Baptist historian. Grijalva, Joshua. A History of Mexican Baptists in Texas. Dallas, Texas: Office of Language Missions, Baptist General Convention of Texas, 1982, second edition, 2003. Grijalva, Joshua. Dos Milenios de Historia Bautista. San Antonio, Texas: Munguía Printers, 2000. In Spanish, a brief history of Baptists with a focus on Hispanic Baptists in America. Grijalva, Joshua. Ethnic Baptist History. Atlanta: The Home Mission Board, 1992. A summary of “minority” Baptists in the United States by a leading Hispanic scholar who has ministered with numerous Baptist groups. Kidd, Thomas S. and Barry Hankins. Baptists in America: A History. Oxford, England: Oxford University Press, 2015. Two Baylor University scholars, each a Professor of Church History with a major interest in Baptist history, present a thoroughly researched and readable book that traces the history of Baptists in America from the colonial period until today. One of the volumes in the Columbia Contemporary American Religion Series, this history focuses on Baptists in America with more attention to recent history than most histories; contains helpful timeline. Leonard, Bill J. Baptist Ways: A History. Valley Forge: Judson Press, 2003. A view of Baptists worldwide with a focus on Baptists in America. Contains an extensive bibliography. This is not a history of African American Baptists but an account of African American churches in general, but it contains valuable insights on Baptists. McBeth, H. Leon. The Baptist Heritage: Four Centuries of Baptist Witness. Nashville: Broadman Press, 1987. A voluminous tracing of Baptist development including Baptist heritage in various parts of the world. Extensive bibliography. Parker, G. Keith. Baptists in Europe: History and Confessions of Faith. Nashville: Broadman Press, 1982. Helpful material from primary sources. Nettles, Tom. The Baptists: Beginnings in Britain-Vol. 1; The Baptists: Beginnings in America-Vol. 2; The Baptists: Modern Era-Vol. 3. Scotland: Christian Focus Publications, 2005, reprint 2009. These three volumes provide a reference-type history of Baptists focusing on persons who helped to shape the history. The volumes contain extensive reference material in the footnotes. Patterson, Frank W. A Century of Baptist Work in Mexico. El Paso, Texas: Baptist Spanish Publishing House, 1979. Written by a former missionary to Mexico and later general director of the Baptist Spanish Publishing House. Porter, John William. The World’s Debt to the Baptists. Wilmington, Ohio: The Baptist Heritage Press, 1991. A reprint of the original published in 1914 that chronicles major Baptist contributions. Shurden, Walter. Not a Silent People: Controversies that Have Shaped Southern Baptists. Macon, Georgia: Smith and Helwys Publishing, 1995. A tracing of Baptist history and thought highlighting Baptist controversy within the denomination and with those outside of it. Stripling, Paul. Turning Points in the History of Baptist Associations in America. Nashville: Broadman & Holman Publishing Group, 2006. A well-documented history from the establishment of the Philadelphia Association in 1707 until its publication, the book focuses on associational development among associations related to the Southern Baptist Convention. Torbet, Robert G. History of the Baptists. 3rd ed. Valley Forge: Judson Press, 1963. One of the basic histories of Baptists by a respected scholar. Vedder, Henry C. A Short History of the Baptists. Valley Forge: Judson Press, 1907. A history of Baptists from New Testament times up to 1900 with a focus on Baptists in England and America but also information on Baptists in other parts of the world. Weaver, C. Douglas. In Search of the New Testament Church: The Baptist Story. Macon, Georgia: Mercer University Press, 2008. A history of Baptists focusing on Baptists in America, but with information on the international presence of Baptists. Contains excellent bibliographical material. Baptist World Alliance. Studies in Baptist History and Thought. Falls Church, Virginia: Heritage and Identity Commission, Paternoster Book Series. A collection of works by Baptist scholars on Baptist heritage and doctrine; it is international in scope. For further information, contact www.authenticmedia.co.uk. Bebbington, David W. Baptists Through the Centuries. Waco, Texas: Baylor University Press, 2010. A well-documented volume that combines history and doctrine. It contains a chapter on the worldwide spread of Baptists. Brackney, William H. A Capsule History of Baptist Principles. Atlanta, Georgia: Baptist History and Heritage Society, 2009. A blend of history and doctrine, termed Baptist principles, by a leading Baptist scholar. Brackney, William H. The Baptists. New York: Greenwood Press, 1988. A relatively concise treatment of Baptist history and thought for Baptists and non-Baptists. A paperback edition was issued by Praeger Press in 1994 with a very helpful bibliographic essay. Estep, William R. Why Baptists? Dallas: Baptist General Convention of Texas, 1997. A book commissioned by the Baptist Distinctives Committee of the Baptist General Convention of Texas to share the Baptist story from a biblical, historical, and contemporary perspective. Garrett, James Leo, ed. We Baptists. Franklin, Tennessee: Providence House Publishers, 1999. 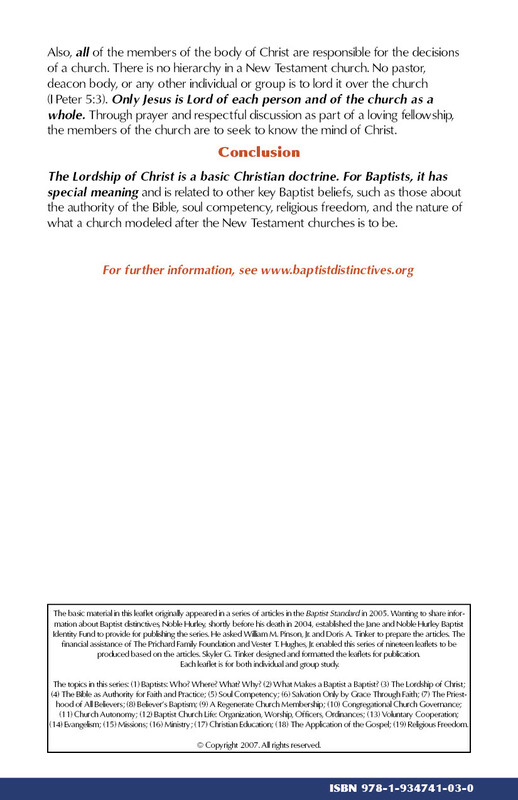 A compilation of articles by the Baptist World Alliance Study Commissions (1995-1999) on history and doctrine. Goodwin, Everett C. Down By the Riverside: A Brief History of the Baptist Faith. Valley Forge: Judson Press, 2002. A brief but thorough and very readable work. Jonas, Jr., W. Glenn, ed. The Baptist River: Essays on Many Tributaries of Diverse Tradition. Macon, Georgia: Mercer University Press, 2006. A helpful resource summarizing the history and beliefs of ten different Baptist groups or traditions in America. Leonard, Bill J. The Challenge of Being Baptist. Waco, Texas: Baylor University Press, 2010. A series of essay-type chapters on the relation of history and doctrine with an emphasis on differences among Baptists. Pinson, Jr., William M. Baptists and Religious Liberty. Dallas, Texas: Baptistway Press, 2007. 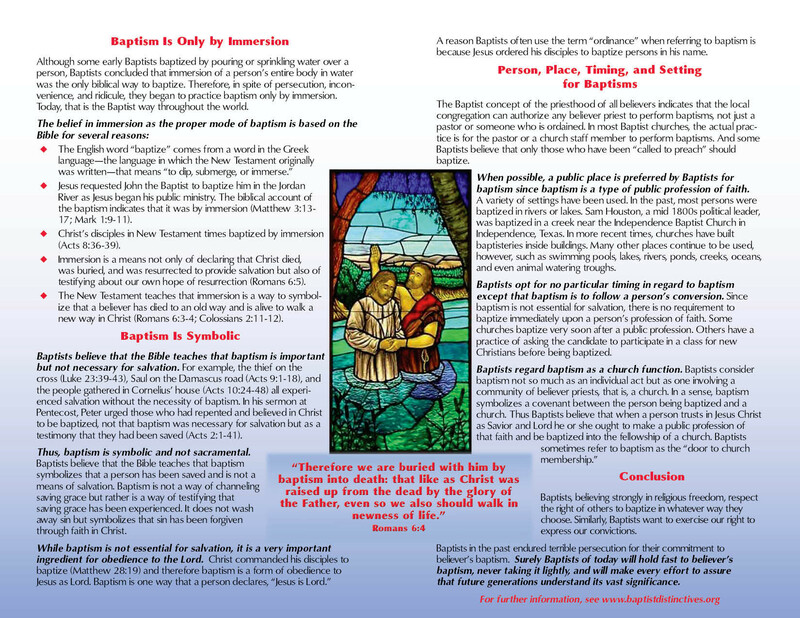 A doctrinal and historical approach to the Baptist commitment to religious liberty. Williams, Sr., Michael E. and Walter B. Shurden, eds. Turning Points in Baptist History. Macon, Georgia: Mercer University Press, 2008. Written in honor of H. Leon McBeth by a number of Baptist scholars, the book contains twenty-four chapters about major events and doctrines in Baptist history. Anderson, Dean. A Sacred Trust: Sermons on the Distinctive Beliefs of Baptists. Bloomington, Indiana: CrossBooks, 2010. Sermons by a pastor preached to a local congregation. Contains an extensive annotated bibliography. Brewer, Brian C., ed. Distinctly Baptist. Valley Forge: Judson Press, 2011. Contains sermons on Baptist distinctives with a focus on casting the distinctives in a contemporary way. Goodwin, Everett C. Baptists in the Balance: The Tension Between Freedom and Responsibility. Valley Forge: Judson Press, 1997. A collection of sermons, sermonic essays, and articles on Baptist life in the late twentieth century. Powell, Paul W. Back to Bedrock. Dallas: BAPTISTWAY PRESS, 2003. A series of sermons on Baptist beliefs based on the 1840 confession of faith of the Union Baptist Association in Texas. Shurden, Walter, ed. Proclaiming the Baptist Vision. 4 volumes. Macon, Georgia: Smyth & Helwys, 1993. Four separate volumes of sermons on the Bible, the church, the priesthood of all believers, and religious freedom. Staton, Jr., Cecil P. Why I Am a Baptist. Macon, Georgia: Smyth & Helwys, 1999. 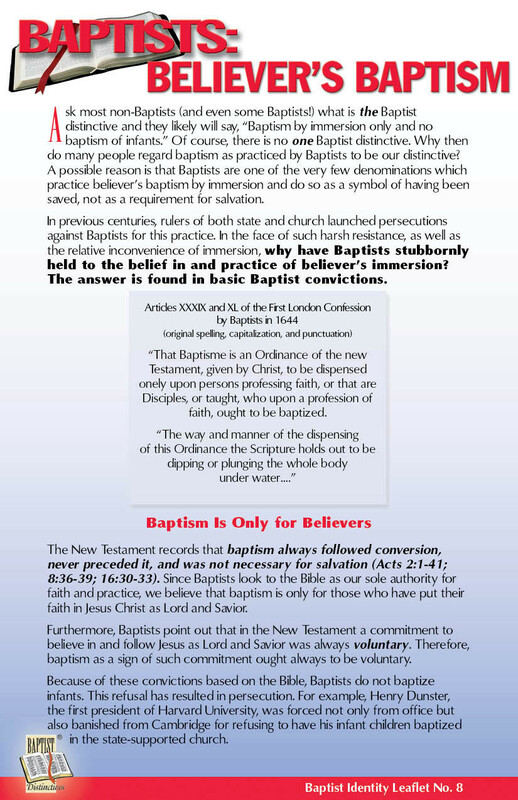 A collection of testimonies by Baptist leaders on why their convictions cause them to be Baptists. Hundreds of biographies of Baptists exist. The following are but examples. Anderson, Courtney. The Life of Adoniram Judson: To the Golden Shore. Valley Forge: Judson Press, 1987. A lengthy (530 pages), well-researched biography of Judson with extensive bibliography. Asher, Louis Franklin. John Clarke. Pittsburgh, Pennsylvania: Dorrance Publishing Co., Inc., 1997. An account of the pastor/physician who was a pioneer in Baptist life in America. Bacote, Samuel William, ed. Who’s Who Among the Colored Baptists of the United States. Kansas City: Franklin Hudson Publishing Co., 1913. Contains brief biographical information with pictures of 130 Black Baptist leaders including men and women, pastors and lay persons, in the late 1800s and early 1900s. Beck, James R. Dorothy Carey: The Tragic and Untold Story of Mrs. William Carey. Grand Rapids, Michigan: Baker Book House, 1992. A thoroughly researched biography on the first wife of William Carey. One of the most influential English Baptist pastors, his encouragement of William Carey’s mission vision provided a turning point in Baptist life. Brumberg, Joan Jacobs. Mission for Life: The Story of The Family of Adoniram Judson. New York: The Free Press, 1980. An interpretive history of the extended family of Adoniram Judson. Contains an extensive bibliography. Carey, S. Pearce. William Carey. London: The Wakeman Trust, 1923. William Carey was the great-grandfather of the author of this extensive biography that includes a number of pictures. Carson, Clayborne, ed. The Autobiography of Martin Luther King, Jr.. New York, New York: Grand Central Publishing, 1998. The estate of Martin Luther King, Jr. selected the author to edit and publish King’s papers, including letters and diaries as well as video footage and recordings. Using these materials, the author develops a self-portrait of King as student, minister, husband, father, and world leader. Chernow, Ron. Titan: The Life of John D. Rockefeller, Sr.. New York: Vintage Books, 1998. Includes information about the Baptist commitment and contribution of the controversial businessman who was considered the wealthiest person in the world. Chute, Arthur C. John Thomas — First Baptist Missionary to Bengal, 1757-1801. Halifax, Nova Scotia: Baptist Book and Tract Society, 1893. A brief biography of the physician/missionary who preceded and worked with William Carey in India. Dallimore, Arnold. Spurgeon. Chicago: Moody Press, 1984. Numerous biographies of Charles Spurgeon exist, some multi-volume. This is a relatively brief, readable account that will introduce persons to the famous preacher. Dawson, Joseph Martin. A Thousand Months to Remember. Waco, Texas: Baylor University Press, 1964. An autobiography of the first Executive Secretary of the Baptist Joint Committee on Public Affairs. Day, Richard Ellsworth Day. The Shadow of the Broad Brim. Philadelphia: The Judson Press, 1934. Published on the one hundredth anniversary year of the birth of Charles Haddon Spurgeon, the book provides an introduction with an American readership in mind. Durso, Keith E. Thy Will be Done: A Biography of George W. Truett. Macon, Georgia: Mercer University Press, 2009. A thoroughly documented biography of one of the most influential Baptists of the twentieth century. Evans, Christopher H. The Kingdom Is Always But Coming: A Life of Walter Rauschenbusch. Grand Rapids, Michigan: William B. Eerdmans Publishing Company, 2004. An account of the person often considered the primary spokesperson of the Social Gospel Movement. Fitts, Leroy. Lott Carey: First Black Missionary to Africa. Valley Forge: Judson Press, 1978. The story of a man who moved from being a slave to becoming a pioneer missionary and in so doing inspired the founding of the Lott Carey Baptist Foreign Mission Convention. Gausted, Edwin S. Roger Williams. Oxford: University Press, 2005. A relatively brief (150 pages) account of the life of one of the significant contributors to religious freedom in America. George, Timothy and David S. Dockery, eds. Theologians of the Baptist Tradition. rev. ed, Nashville: Broadman and Holman Publishing Group, 2001. Contains brief biographies of sixteen influential Baptists from the eighteenth to the twenty-first centuries with a discussion of the theologies of each. Goodwin, Everett C. Down by the Riverside. Valley Forge: Judson Press, 2002. Contains a brief history of Baptists, a summary of basic doctrines, and a select bibliography. Graham, Billy. Just As I Am: The Autobiography of Billy Graham. New York: Harper Collins Publishers, 1997. A personal, enthralling account of the most famous evangelist of the twentieth century, complete with pictures. Harper, Keith and C. Martin Jacumin, eds. Esteemed Reproach: The Lives of Reverend James Ireland and Reverend Joseph Craig. Macon, Georgia: Mercer University Press, 2005. The volume is part of the Baptist History, Literature, Theology, Hymns project of the Center for Baptist Studies, Mercer University. Hoadley, Frank T. and Benjamin P. Browne. Baptists Who Dared. Valley Forge: Judson Press, 1980. Contains brief biographies of twenty-three Baptist American men and women from Roger and Mary Williams to Martin Luther King, Jr.
Jones, Jeffrey D. Keepers of the Faith. Valley Forge: Judson Press, 1999. Contains one-page biographies in cartoon style of a variety of Baptists. Designed so that each page can be easily copied. Lancaster, Daniel B. The Bagbys of Brazil. Austin, Texas: Eakin Press, 1999. A relatively short biography of two of Baptists most influential pioneer missionaries, William Buck Bagby and Anne Luther Bagby with extensive bibliographical resources. Leland, John and L.F. Greene. The Writings of the Late Elder John Leland: Including Some Events in His Life. New York: G. W. Wood, 1845. This is a reproduction of the original work. Long, Julie Whidden. Portraits of Courage. Macon, Georgia: Mercer University Press, 2008. Brief biographies of fourteen Baptists, some of whom are well known and others are not. McLoughlin, William G. Isaac Backus and the American Pietistic Tradition. Boston: Little, Brown and Company, 1967. The biography of one of Baptists major leaders in the early years of the American republic with a focus on his efforts for religious freedom. Mangalwadi, Vishal and Ruth. The Legacy of William Carey. Wheaton, Illinois: Crossway Books, 1993. Written by Indian Christians who are continuing the work of Carey, the book focuses on the breadth of Carey’s impact on India. Pollard, Edward B. and Daniel Gurden Stevens. Luther Rice: Pioneer in Missions and Education. Columbia, South Carolina: Richbarry Press, n.d.
A relatively brief (127 pages) on the life of one of the most influential Baptists in American history. Prestridge, J. N., ed. Modern Baptist Heroes and Martyrs. Amsterdam, The Netherlands: Fredonia Books, 2001. A reprint of the 1911 edition, the book contains brief biographies of Baptists in several countries that describe sacrifice and courage of each. Rogers, James A. Richard Furman: Life and Legacy. Macon, Georgia: Mercer University Press, 2001. This well-documented biography of one of the most influential leaders in the development of Baptist denomination in America contains pictures and an extensive bibliography. Routh, E. C. Life Story of Dr. J. B. Gambrell. Oklahoma City: E. C. Routh, 1929. An account of the various major areas of the life of one of Baptists most dynamic leaders. Seale, William. Sam Houston’s Wife: A Biography of Margaret Lea Houston. Norman, Oklahoma: University of Oklahoma Press, 1970. A biography of the person most credited with the conversion and Baptist church membership of Sam Houston. Contains extensive bibliographical resources. Tull, James E. Shapers of Baptist Thought. Macon, Georgia: Mercer University Press, 1984. A reprint of an earlier volume, it contains brief biographies of nine influential Baptists from John Smyth to Martin Luther King, Jr.
Wayland, Francis. A Memoir of the Life and Labors of the Rev. Adoniram Judson. Boston: Phillips, Sampson, and Company, 1853. A two volume work by the then President of Brown University that contains commentary by Wayland and copies of Judson’s correspondence as well as other documents related to Judson’s life. Wellman, Sam. John Bunyan. Uhrichsville, Ohio: Barbour Publishing, Inc., 1996. Celebrate Freedom! Macon, Georgia: Smyth & Helwys, 1998. A Vacation Bible School curriculum based on important Baptist principles. Human, Johnnie. Let’s Explore Baptist Beliefs: A Children’s Guide to Basic Biblical Teachings. Dallas: BAPTISTWAY PRESS, 2004. Along with a companion volume for teachers and group leaders this colorful book provides inspiration and information for children; designed for either individual or group study. Jones, Jeffrey D. Keepers of the Faith: Illustrated Biographies from Baptist History. Valley Forge: Judson Press, 1999. One-page stories of eighty influential Baptists with special appeal for children but useful for all ages. Jones, Jeffrey D. and Debra L. Sutton. We Are Baptists: Studies for Youth. Valley Forge: Judson Press, 1999. A fourteen-part workbook style resource to aid young people understand Baptist beliefs and practices.